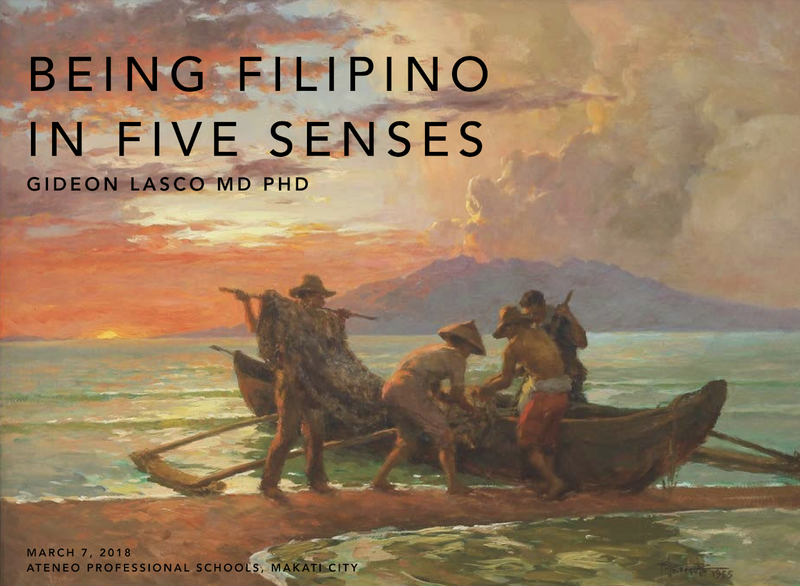 On March 7, 2018, I had the opportunity to share "Being Filipino in Five Senses", an overview of the cultural history of the senses in the Philippines with the Museum Volunteers of the Philippines' History Program, which was held at the Ateneo Professional Schools in Rockwell, Makati City. Sniff kisses, for their part, are part of a broader body language. If you look at romantic scenes in Filipino movies—or if you reflect on your own romantic experiences—the act of sniffing is likewise privileged. We experience each others’ bodies not just with the visual (seeing) or the tactile (touching) but also with the olfactory (sniffing). And from a neuroscientific perspective, this again makes a lot of sense, as the olfactory bulb—the part of the brain responsible for smell—is a component of the limbic system, which is the seat of memories and emotions. Scents, then, allow us to memorialize experiences and bodies in a more sensorial, sensual way. Surely there are many more materials waiting to be unearthed, dealing with the tactile, the olfactory, the gustatory, the auditory, and the visual - and this is a research interest I intend to pursue in the future.